Theatre a L’Italienne is a historical monument, built in 1882 on the site of the old covered market in grain. The skilful architect Charles de Lalande led the construction work of this excellent example of the Italian architecture, which is considered to be one of the jewels of the last generation Italian theatre made in France. The Interior designers of the famous Paris Opera were assigned the responsibility to decorate this theatre. 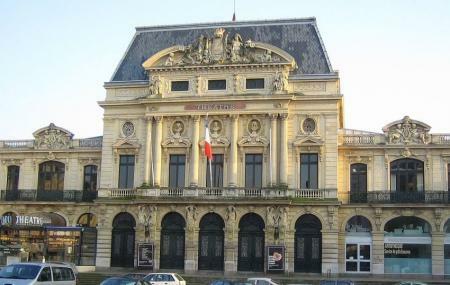 Also renowned as ‘the golden theatre’, it houses the team and the programming of the National scene in Cherbourg. After some restoration work done the beautiful crystal chandelier in 2007, the theatre underwent a vast renovation process from January 2010 to January 2012. The site has France’s most unique acoustic system and digital multicasting; also it boasts of the most modern accessibility andstage equipment. Free-guided tours are organized during summer. Timings will depend as per show schedule. Check before. How popular is Theatre A L'italienne? People normally club together Basilique Sainte-trinite and Chateau Des Ravalet And Park while planning their visit to Theatre A L'italienne.